The Power of Non-repellent Imidacloprid. The Advantages of THOR. Some termiticides work by not letting termites pass through an area that has been treated with them. Termites, when they encounter soil treated with this type of termiticide are repelled. These termiticides are referred to as repellents. In contrast, some termiticides work by allowing termites to "pass through", thereby setting a deadly trap. These termiticides that allow termites to pass through are referred to as non-repellents. Imidacloprid belongs to the non-repellent group of termiticides. You might wonder, why is it an advantage to not repel termites ants to instead let them pass? Here's why. When applied to the soil at recommended concentrations, termites can't detect imidacloprid in the soil. This means termites foraging in imidacloprid treated soil for food are not repelled but instead pass through it like the imidacloprid isn't even there. This penetration results in these foraging termites being exposed to imidacloprid which transfers from the soil onto the exterior of their bodies. Because the toxic action of imidacloprid is delayed, only later are the imidacloprid contaminated termites killed by their exposure to imidacloprid treated soil. For this reason, imidacloprid is referred to as a non-repellent termiticide. Prothor is great for termites. But it's also great against perimeter invading ants! Prothor puts the proven power of imidacloprid to work for you against a wide range of perimeter invading ants. Prothor can be used at almost all points on your customer's property where ants nest, congregate and forage. Prothor puts the proven power of imidacloprid to work for you against a wide range of perimeter invading ants. Imidacloprid's power against perimeter invading ants has been shown in University testing. Testing at Purdue University in 2004* showed the power of imidacloprid to stop perimeter invading ants in their tracks. Imidacloprid applied as a perimeter band according to the label directions of a competing imidacloprid containing product stopped perimeter invading ants cold for at least 30 days. Compare that to the active ingredient cyfluthrin which gave significant control of ants for only two weeks in side by side testing. Prothor containing imidacloprid has several advantages in use compared to other products intended to control perimeter invading ants. Some perimeter ant treatment products can only be applied preventatively in a narrow strip along the perimeter of the structure at ground level. However, Prothor can be applied as a general surface treatment to structure exteriors to control ants. Prothor can also be applied to structural cracks, crevices and voids. If ants are outside, in almost every case you can treat them with Prothor where they are on the structure. Some perimeter ant products face severe limitations on their treatment frequency. However, Prothor can be reapplied for ants as often as every 30 days. And unlike some products, there is no limitation on the number of times it can be applied per year. Prothor can be used almost anywhere in a customer's yard. Us it on ornamentals, turf, trees, etc. to indirectly control ants by eradicating ant food surfaces. If ants are there, you can treat them with Prothor. Prothor in suspension concentrate form can be tank mixed with other insecticides to create a one-two punch against ants. Always read and follow label directions. 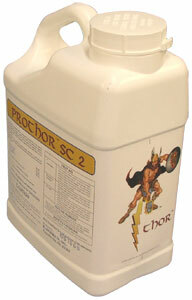 Prothor SC2 is also labeled for control of a wide range of turf and ornamental pests. *Study published in the April 2004 issue of the Journal of Economic Entomology.